A lovely blend, producing large, trumpet-like blooms in shades of scarlet, white and violet, many attractively bicoloured. Ideal for growing in 12cm (5) pots for houseplants. Flowers August-September.For BEST VALUE, Pick and Mix any 4 or more packs and get the cheapest pack FREE! - excluding Lily pollen-free Collection. 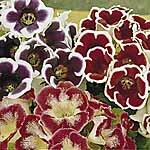 See photos of plants from the <a href="/genus/Gloxinia">Gloxinia</a> genus in real gardens.